I posted this on facebook the other day and I thought I would expand it to the world. 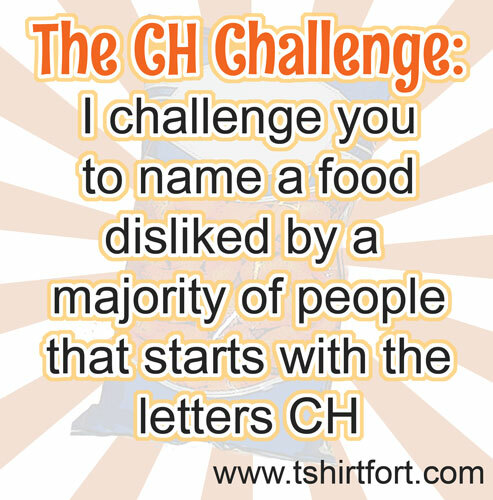 I challenge you to name a food disliked by a majority of people that starts with the letters CH. First think about how many awesome foods start with these letters. Cheese, chocolate, cherries, chips, chicken, cheetos, chimichangas, churros, cheddar, etc… Now try to name something most people dislike that starts with these two letters. It should be fairly mainstream and a real food. So try to avoid answers like chimpanzee meat or chum. Also it should be fairly common to where you live. I’m basing this off an American palate, where ch foods are awesome for the most part. Also chutney is more of a spice than a real food into itself so don’t say chutney. So far my facebook responses are chard, chicken feet, and cheetos because they’re salty. Of these I am giving the prize to chard (sorry no real prize but give yourself some cheetos as a reward). I’m not 100% sure what chard is but I think it’s a bitter root in salads and if that’s the case then yuck, you win. Also the majority of people I know don’t really consider Chicken feet an actual food (Sorry Asia, but like I said I’m going off an American palate) As for cheetos, sorry but you are the only one who doesn’t like cheetos and this game is about finding foods a majority of people don’t like. You know what’s also good; those Planters cheez balls that came in a round box in the 80’s. Damn those were awesome. So anyway that’s the CH Challenge. Try it on your friends and family and spread the word. Try it on a road trip, especially if you can’t afford satellite radio, and you need a way to pass the time. You can also repost the picture above.